The Palestinian national identity isn’t the roadblock to peace in the region. Instead, it’s the fact that Palestinians are denied their basic right to exist in peace, freedom and equality on their ancestral homeland, writes Samah Sabawi. Ted Lapkin’s claim that Palestinian national identity is a roadblock to peace is a disingenuous attempt to justify the brutal reality Israel imposes on Palestinians every day. Lapkin asserts Palestinian nationalism evolved in the 1920s as a negative reaction to Zionism, making attempts at reconciliation “impossible” as it would negate “the central pillar” of the Palestinian existence. This claim ignores the fact that distinct Palestinian nationalism began in 1834, well before the beginning of the Zionist project in Palestine, in what became historically known as the Peasants’ Revolt against Egyptian tax policies and forced conscription. But all of this is really beside the point. Defining the exact moment at which the modern construct of Palestinian nationalism was forged or pontificating its motivation is of no real value when attempting to resolve the Palestine Israel conflict or to address the Jewish and Palestinian claims to the land. A distinctly Palestinian national sense-of-self evolved during the 1920s – not organically, but as a negative reaction to Zionism. And this fact is at the centre of the current conflict, writes Ted Lapkin. Citizenship and defined borders alone do not forge nationhood. Nationalism is also forged through shared cultural identity, collective experience, ethnicity and a sense of belonging to or continued habitation of a place. The Jewish claim to Palestine is derived from religious connections, stories from the Hebrew Bible (the Old Testament) as well as recent habitation of land. The Palestinian claim is far more concrete; it is based on the Palestinian people’s continuous habitation and uninterrupted contact with their land. Of course, but I would not say that the Jewish claim, or the Zionist claim, is the only claim or the main claim. I say it is a claim among many others. Certainly the Arabs have a much greater claim because they had a longer history of inhabitance, of actual residence of Palestine than the Jews did. The land of historic Palestine witnessed the rise and fall of many civilizations including the Canaanites, the Israelite, the Assyrians, the Babylonians, the Persians, the Greeks, the Romans, the Byzantines, the Crusaders, the Muslims, the Ottomans right to the end of British rule. To give preference to one of these civilizations above all others as the only claim, and to use this claim to drive out people from their homes at gunpoint and into refugee camps is the ultimate definition of fundamentalism and abuse of human rights. A study by a group of Israeli and US scientists (Nebel et al 2000) found that Muslim Arabs in Palestine and Israel “descended from local inhabitants, mainly Christians and Jews, who had converted after the Islamic conquest in the seventh century AD”. So while the Zionist narrative tells the story of Jews returning, Palestinian history and DNA tells a story of a people who remained throughout the centuries, adopting Judaism, later Christianity and finally Islam. Today, Palestinians are Arabs, with a large Sunni Muslim majority, a significant Christian minority and smaller minorities of Druze and Samaritans. Palestinian Jews were a small minority of the population of Palestine prior to the creation of the State of Israel, and most now consider themselves Israelis. The definition of who is Palestinian was always inclusive of diverse religions and sects, unlike what remains at the core of the definition of the state of Israel – an exclusive state for the Jewish people. The original 1968 Palestinian National Charter, often referenced as the first document on Palestinian nationalism, defined Palestinians in Article 5 as “Arab nationals who, until 1947, normally resided in Palestine regardless of whether they were evicted from it or stayed there”. Note “Arab nationals” is notreligious-specific, and therefore implicitly includes Muslims, Christians and Jews who are Arabic speaking and reside in Palestine. In fact, Article 6 of the charter clearly states, “the Jews who had normally resided in Palestine until the beginning of the Zionist invasion will be considered Palestinians”. The Palestinian National Charter was further amended in 1998 to include an affirmation of Israel’s right to exist. Contrary to what Mr Lapkin would have us believe, national identities do not rise out of spite, but can certainly be strengthened when a population is placed under attack. 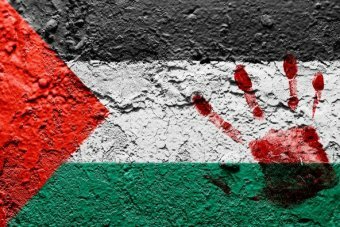 Palestine was wiped off the map in 1948, and Palestinians have faced Israeli ongoing oppression, dispossession and violence. Coincidently, on the same day The Drum published Mr Lapkin’s article, a video of an Israeli soldier’s failed attempt to arrest a Palestinian boy went viral. The video captured a masked armed soldier in the West Bank holding an injured Palestinian child in a chokehold, while the boy’s mother and other women tried to rescue him from the soldier’s grip. The desperate mother screaming, “my son … my son … he is only a child”. That video spoke volumes about the real roadblock to peace. 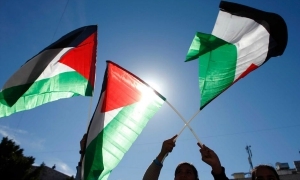 What is central to the conflict right now is not the concept of nationalism, which is ever evolving, but the fact that Palestinians are denied their basic right to exist in peace, freedom and equality on their ancestral homeland. Samah Sabawi is a Palestinian Australian author, commentator and playwright. She is a policy advisor to Al-Shabaka: the Palestinian Policy Network.